Sri Venkateswara Montessori Teachers Training School celebrated the 29th Convocation Day on July 26 at Sri Venkateswara Montessori Teacher's Training School. The director, A.Jaya veerapandian, and Course Directors, J.Subash and N.Vijaya, welcomed the chief guest, Mrs.Deepa, who attended the programme on behalf of Dr.K.S.Lakshmi, Secretary and correspondent, Meenakshi College for women. Punitha Ganesan, Secretary, Bharat Arts and Science College, Thanjavur was the guest of honour. Stories, picture charts, albums and models of sense organs, living rooms and musical instrumants were displayed during the celebrations. The display was informative and attractive. 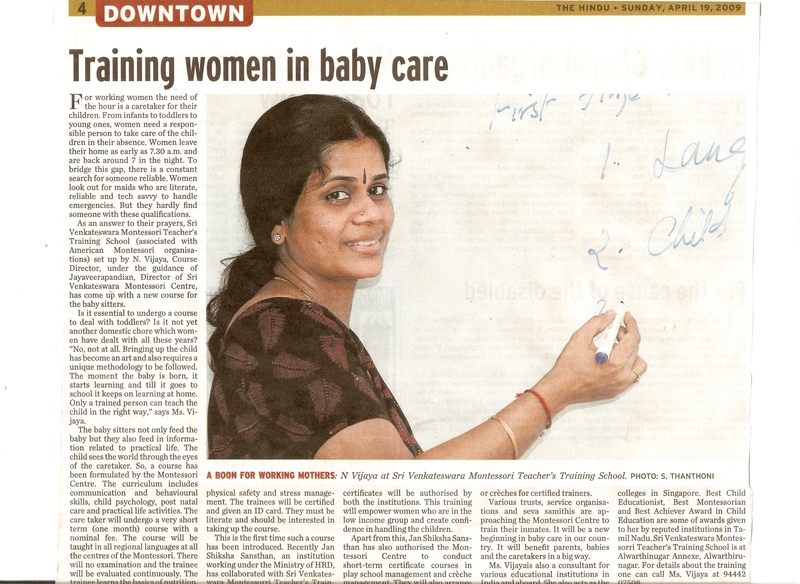 Mrs.Deepa insisted on the role of a teacher in moulding the personality of a student. Mrs.Punitha said that language should not be a barrier to communicate with others and mother tongue was the best way to interact with a child. Sri Venkateswara Montessori Teachers Training School says it is offering courses for higher secondary level candidates and for anyone who wants to teach. Diploma and degree level courses are offered in regular classes and by correspondence. According to a statement from the school, it is operating for four years and affiliated to American Montessori Society. The school has efficient trainers and uses innovative methods to develop an outstanding teaching capabilitites in the trainees, it says. The school is engaged in regular workshops, orientation programmes and refresher courses throughout South India. It has five branches in Chennai, seven study centres in the rest of Tamil Nadu and one facility in Kerala.